Lowering your cost while helping the environment. Utility companies have been working with solar developers, to develop a plan for future renewable energy growth in the region. This collaborative work resulted in a new law known as “Competitive Energy Solutions for North Carolina,” and will continue to enable the growth of renewable energy in a more meaningful way for customers. Why Do Utility Companies Encourage Solar? Think of the Utility Company like a bank. The extra credits that you generate throughout the day are stored on the grid which are sold to other customers for profit. The extra credits that you generate during the day benefits the Utility because the demand is highest during the day. At night when the suns not out the utility is happy to give you your credits back when the demand is low. Customer wins because they get power at a lower rate and not subject to inflation. The Environment wins because more clean energy is being produced. The panels on your roof will over generate energy throughout the day. The extra energy is put back on the grid. 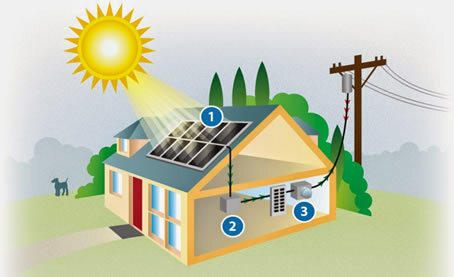 At night, the extra energy you earned is given back to you from your utility company through your Bidirectional Meter. When a customer chooses net metering, we replace the meter at the customer's home with a bidirectional meter that measures two-way flow of electricity. Net metering customers are charged only for the “net" power that they consume from the electricity service provider that has accumulated over a designated period. If their renewable energy-generating systems make more electricity than is consumed, they may be credited or paid for the excess electricity contributed to the grid over that same period. First Step: Email us a copy of the graph from your most recent utility bill because that will show us your usage over a 12-month period. This enables us to know how many panels you would need to cover your average usage. Second Step: We’ll enter your usage into our software which will look at the direction and pitch of your roof, as well as shading in order to determine how many panels it will take to cover 100% of your annual electric usage. Third Step: We’ll call you with the custom results for your home so that you can decide for yourself if Solar makes sense for you. The Federal Government will pay for 30% of your system through tax credit. Several utilities will pay you up to $2500 for installing solar panels on your home. The installation and equipment financed is less expensive than staying with your utility company. Having solar panels on your roof replaces your utility bill. That utility rates are going up faster than inflation. Attach a picture or write down how much annual power usage you use. You can easily get this from online power company account or call you power provider and they will provided it for you. (This is necessary to create an accurate proposal for your home). By pressing this button, I consent to having this website store my submitted information so they can respond to my inquiry.